Rip4Audio offers a simple and easy way of letting users rip audio out of multiple movie clips at a time. Rip4Audio supports a wide range of media formats including 3G2, 3GP, AVI, DV, FLV, MKV, M4V, MOV, MP4, MPEG, WMV. Simply, drag and drop one or more movie files onto a drop box. 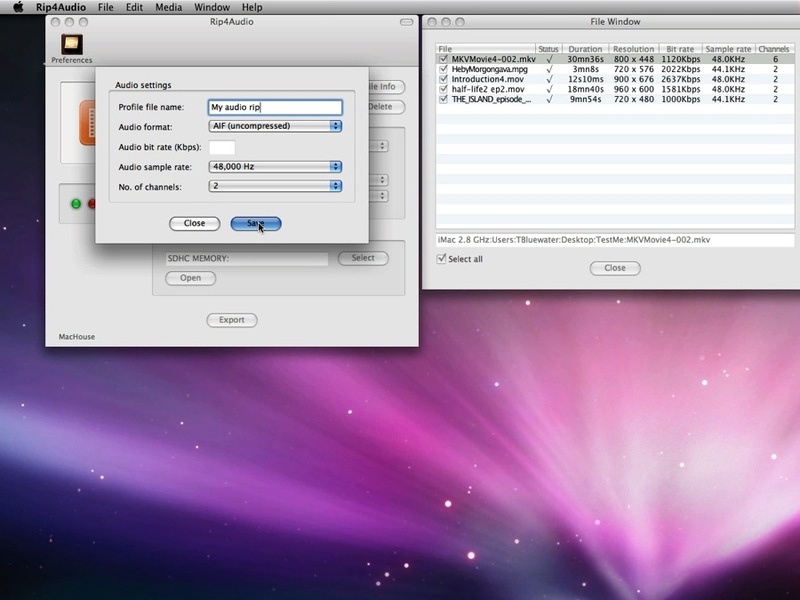 Then choose an export format (AAC, AIF, MP3 or WAV) and work on other audio settings. And? Just click on the Export button. Batch-rip audio out of multiple movie files at a time. No QuickTime component is required. QuickTime Player is not required, either. Click on the button to download a demo/trial version of Rip4Audio for Mac OS X 10.5 and 10.6. Fix: When the user leaves the number of channels unselected, the application will automatically set it to 2. Fix: When the position of the application window is moved out of the edge of the desktop, the application could misbehave. Please note that it may take Mac App Store several days to weeks or even a few months to just begin reviewing this update. In order to enhance application's stability, all Preferences settings are stored in an encrypted database. The user must work on Preferences settings from a scratch. We apologize for the change. Fix: The application might have crashed under Snow Leopard. The last release was built for Intel Macs only by mistake. The audio bit rate entry is better-validated with no possibility of the decimal point or comma. The user can now edit existing audio profiles by clicking on the Edit button. An issue involving saving/loading audio presets is fixed. 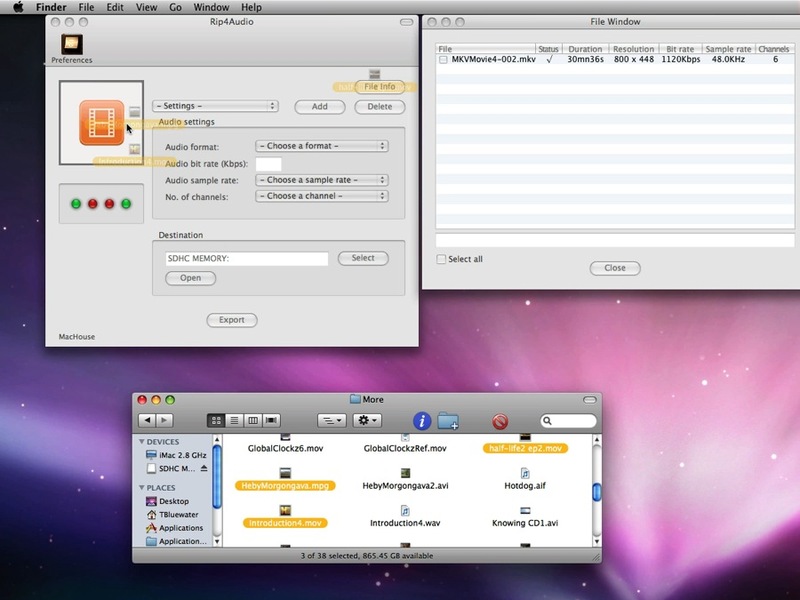 The application is fully compatible with Snow Leopard. The system folder has moved to Users > User > Library > Preferences. Rip4Audio is a product of MacHouse.